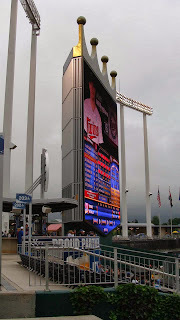 Day Five has already been a great day, yet a ball game awaits at Kauffman Stadium. On our way to the hotel, Mitch spots something you don’t see every day (unless you live in Kansas City): a cow on a pillar on a hill high above the treetops. We’re thinking this bovine is somehow related to CowParade Kansas City, but someone in the know can (hopefully) provide the true story. Our hotel is conveniently just across the Interstate from the ballpark. As we arrive, we see plenty of both Twins and Royals gear. I guess we aren’t the only ones on a baseball trip this week! Fortunately, the hotel room offers my favorite view. (Below is an actual shot I took from the hotel room window.) I’ve stayed in hotel rooms in Philadelphia, Baltimore and Cleveland where I’m actually closer to the stadium, but this is as close to Kauffman as one can stay. We don’t have much time if we want to enjoy our usual pre-game. As a starting pitcher prepares on game day, Mitch and I need to soak in the park early to enjoy the amenities before the first pitch. Shuttle buses leave the hotel parking lot every few minutes. 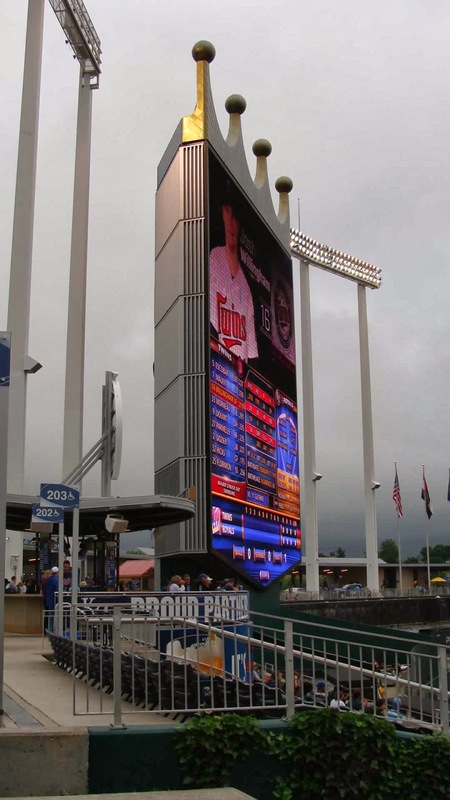 We step onto one with several Twins and Royals fans. There’s a buzz of excitement as the driver asks baseball trivia questions. Eager fans respond. We pull up to a gate where Mitch and I acquire our tickets for the evening. After a quick jaunt around part of the outside of the stadium, we enter and head for the fountains. I never realized how close they were to the playing field or to the spectators. See the fence behind Brett’s statue below? It’s directly adjacent to the fountains. Across the concourse from the fountains, a sign promotes college student Happy Hour: hot dog and craft draft for $7. Usually unheard of in MLB parks, so Mitch and I partake. After snapping some fountain and statue photos, we head toward left field and the Royals Hall of Fame. A brief video with stadium seating (second time today, I know!) precede Royals memorabilia and a shop featuring Hall of Famer gear. Behind the concourse (away from the left field wall) from the Hall of Fame is a netted mini-ballpark, where younger employees/interns pitch whiffle balls to youngsters. This was a great, unexpected family gem. Mitch and I wanted to participate, but decided to allow for some dignity. Looked like fun though! At this point in the season, Minnesota is ahead of the Royals in the AL Central. The game starts out offensively. Josh Willingham knocks in a 1st inning run off Jeremy Guthrie, but the Royals answer with 3 in their half. Thanks to Salvador Perez and Billy Butler accounting for 5 of KC’s 8 hits, the home team pockets a 4-1 win. Throughout the game, Mitch and I make our usual rounds for different perspectives. One perspective eludes us, however: the Buck O’Neil Legacy Seat. The only differently colored seat in the stadium is behind home plate in the Diamond Club area. Near the end of the game, we strike up a conversation with an usher, who radios to the usherette near the Legacy Seat. “Can these gentlemen take photos after the game?” She responds that we could once the Diamond Club area clears out. It’s worth the wait. Especially considering the meaning behind it. Following the game, we look forward to a frothy beverage or two and maybe an appetizer in the hotel’s sports bar. That’s when we discover a true marketing gaffe. While on the shuttle van, we agree that I’d get a table for us while Mitch drops off his camera in the room. We figure that post-game celebrations would abound in such a convenient venue with a captive and thirsty hotel audience. I’m a little surprised to only see a few folks at the bar and none seated at the many tables. The waitress invites me to sit anywhere, but they aren’t serving food. Mitch is in disbelief when I relay the message. Okay, it’s barely 10 PM after more than 12,000 people leave a baseball game across the street. You’d think they’d want to keep the kitchen open a couple of hours to serve a percentage of them 81 days a year. So we check apps. We have to drive away from the hotel to pay someone else to satisfy our appetites. Am I missing something here?